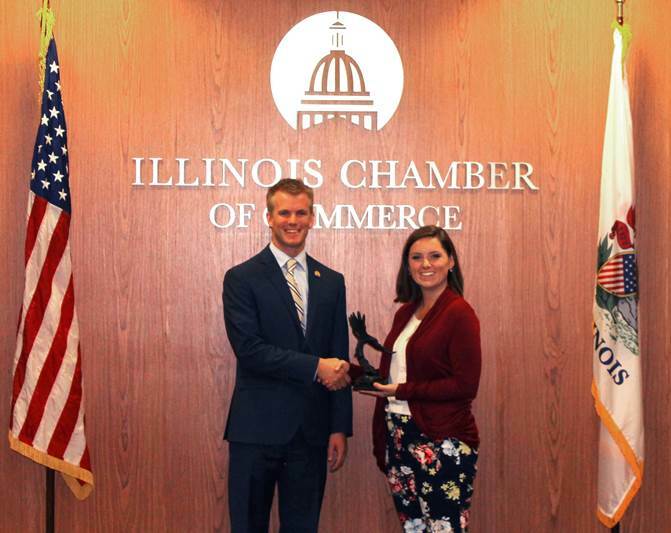 The Illinois Chamber of Commerce today gave the Champion of Free Enterprise – Outstanding Freshman Award to State Representative Avery Bourne. The award is given biennially to state legislators who recognize the importance of free enterprise, and who agree with pro-business legislative policies to further economic opportunities for Illinois businesses and their employees. “With Illinois’ lackluster economic performance, there has never been a more crucial moment for our state to embrace pro-business legislators who represent the business community and support the fundamental principles of the free market system,” said Todd Maisch, president, and CEO of the Illinois Chamber of Commerce. “The Champions of Free Enterprise are exactly the types of lawmakers who will encourage investment in Illinois and help it become more competitive with other states. We appreciate Representative Bourne’s dedication to the good of all of Illinois,” Maisch added. In order to be eligible for the award, a lawmaker must have received an average of 85 percent or better voting record over the previous two General Assembly sessions as rated in the Illinois Chamber of Commerce Legislative Rating published at the end of each session. The Chamber awards one freshman lawmaker from each house who has demonstrated a 100% voting record as the Outstanding Freshman Lawmaker.